Well, it’s not what I was expecting, that’s for sure. 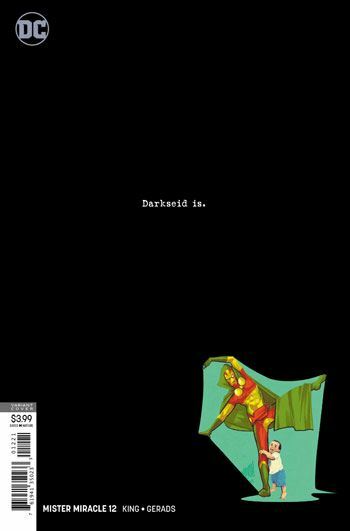 King and Gerards bring their Mister Miracle series to a resolution, but it’s not exactly a clear one. Honestly, I am left wondering about elements of the story that I was wondering about issues ago. To what degree are the events in this story real? 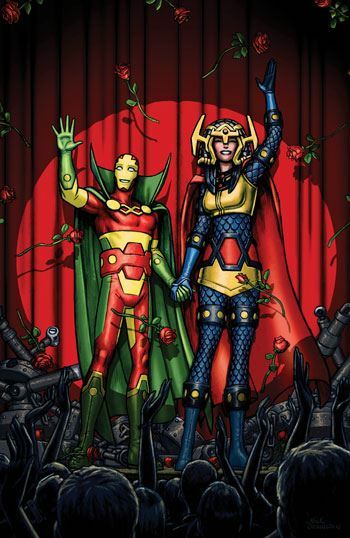 I assume, from issue 11, that the Mister Miracle appearing in this book is not the same as the Mister Miracle that is part of DC continuity. Metron seemed to make that clear. And that’s fine. But for so many issues now I suspected that he was hooked up to the Lump; that the events that were playing out were some kind of psychological game he was being subjected to. In a way, that is true whether or not the Lump was involved. Darkseid has manipulated Scott brilliantly, and the torment he has gone through is no less real for being real. Geez, that was a terrible sentence. But I am still feeling at sea about this book. I was so thrown by the second page of the story. As I read it, all I could think of was Pam waking up and finding Bobby Ewing in the shower, and the previous season of Dallas all being a dream. Looking at the page again, I find it very hard to believe that this was not the intent of King and Gerards, the parallels are so close. But then, does that make the rest of the story a dream? Or what has come before? I think it is safe to say that I was not entirely satisfied with this finale. But I have come to admire Tom King’s writing so much that I tend to feel the failing is with me, not with him. That I have simply failed to pick up on what he has been laying out. It’s a credit to him, and to the wonderful artwork by Gerards, that despite this sense of disappointment I still enjoyed the final issue, and am committed to coming to a greater understanding of the entire series.